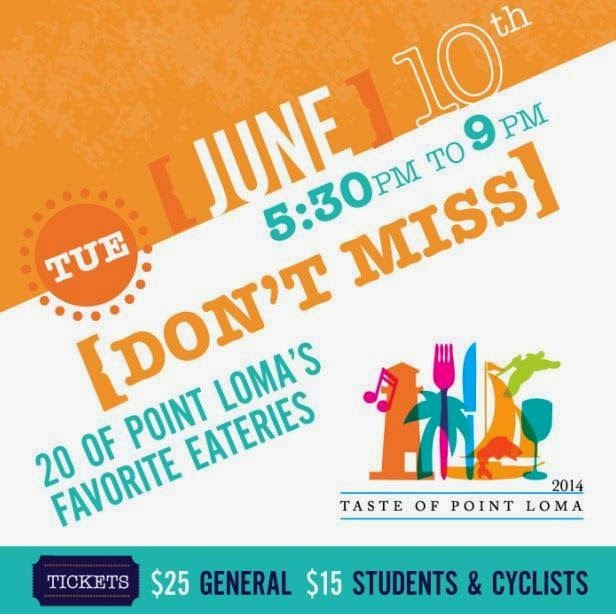 The Peninsula Chamber of Commerce announced this year’s 25th Annual Taste of Point Loma will take place next Tuesday, June 10 from 6-9pm, offering samples from 20 local restaurants and eateries. The annual dining-out event will draw thousands of attendees anxious to sample cuisine from a range of restaurants within the space of one exciting evening, and SanDiegoVille has two passes for one lucky reader. Just enter your email and confirm your address, and we'll contact the winner next week! The Taste of Point Loma 2014 will showcase an eclectic array of local San Diego eateries, each offering a sampling of a signature dish from their menus. Guests will also savor panoramic views of the bay, spanning from downtown San Diego to the Point Loma Peninsula. The cost of admission is $25 per person or $15 for active duty military and college students. Pre-sale tickets are available online at showclix.com/event/TasteofPointLoma or from The Wine Pub at 2907 Shelter Island Drive, Suite 108, or State Farm’s office at 4148 Voltaire Street. Tickets will also be available in the parking lot of the Point Loma Brigantine Seafood restaurant on the day of the event. Shuttles will be provided to assist attendees in moving from one location to the next. Participating restaurants include The Elegant Truffle, Bali Hai Restaurant, Blue Wave Bar and Grill, The Brigantine, The Wine Pub, Fiddler’s Green Restaurant, Northside Shack, Living Room Café, Miguel’s Cocina, Mitch’s Seafood, Old Venice Restaurante, Quarterdeck at Bay Club, Point Break Café, Redz & Greenz and more. Proceeds from The Taste of Point Loma 2014 will benefit the Peninsula Chamber of Commerce and its various community programs, including scholarships for Point Loma High School, traditional 4th of July fireworks, the Point Loma Summer Concert series and various luncheons and mixers for the community.